Congenital Heart Defects (CHD) are a lethal constellation of birth defects, of the heart, that affects millions of new born infants and children worldwide. Eight of every 1000 children born alive will have some form of congenital heart defect. We must raise awareness of the need for funding for research because CHD is the most common birth defect. (According to the Children’s Heart Foundation). Show your support for CHD Research by attaching this Support CHD Awareness Key Chain to your Keys. 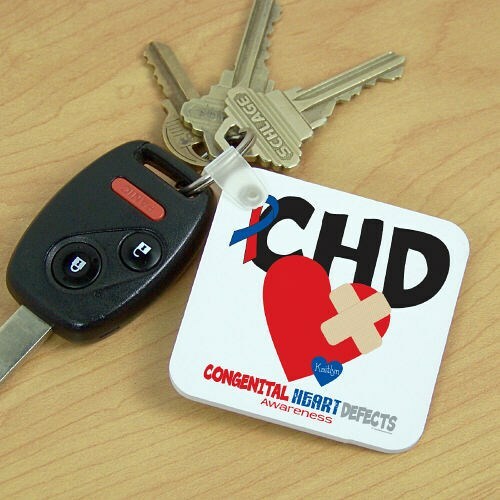 Your CHD Awareness Key Chain is perfect for spreading awareness. Our Congenital Heart Defect Key Chain measures 2¼" x 2¼" and is 1/8" thick. Each Key Chain is made of fiber glass reinforced plastic and includes a key ring. FREE Personalization is included! We will personalize this key chain with any name. Additional Info Our number one goal is to help create awareness. Shop MyWalkGear.com for all of your Awareness Apparel & Walk Gear. Be sure to also view this great design in our CHD Awareness Long Sleeve Shirt & our CHD Awareness Hat as well.